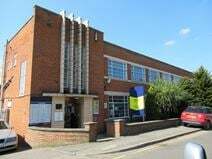 A selection of offices, studios and workshops are available in Borehamwood. Available in various size, these spaces can be tailored to your needs and would perfectly suit companies looking for a film/studio/sound stage. An attractive new business centre with state of the art technical facilities and sophisticated, spacious interiors. A variety of office units are offered with use of conference facilities, lounge areas and parking. The centre is in a peaceful area not far from M1 and M25 junctions, and access to the Thameslink service just around the corner, meaning London is just over 20 minutes away. Tenants benefit from 24-hour access to the space. An impressive modern centre with a stunning glass atrium and a vast amount of well lit, contemporary designed office accommodation to let as well as numerous meeting rooms and pleasant communal spaces. The property is in the heart of Borehamwood, ideal for shops and transport services. Located just a short walk from the local railway station, and close to shops and cafes, this boutique business centre offers a friendly yet professional work environment. Modern, flexible office space suitable for a range of businesses with in-house support and stylishly furnished premises. Leaseholders benefit from access to parking and storage space and the building stands near to good road routes and an expanse of parkland. This friendly serviced office centre can provide for your changing business requirements, and offers independent business advice from our resident experts. The centre enjoys an excellent location, a short drive to a shopping complex, easily accessible from major motorways, and with local bus and tube links in abundance. Pleasant office space over 2 floors of a new centre with a well presented reception area and dedicated in-house support. This property is blessed with its own café, showers and parking and is linked to a number of centres nationwide. Elstree and Borehamwood train station is a few minutes’ away.